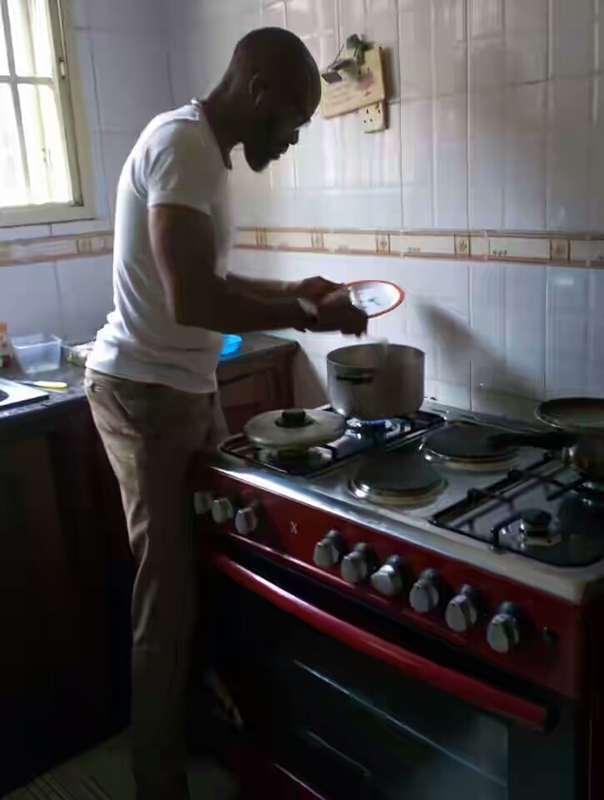 JD Kosita-Madu, a Port Harcourt based man took to his Facebook page this afternoon to make an example of how anyone can prepare a meal by managing cheap resources. 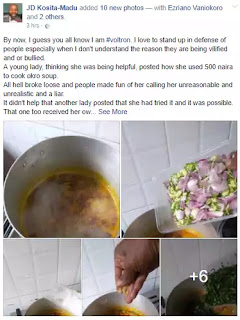 To dismiss accusations that it was unrealistic to cook any soup with a very cheap budget, he prepared Okro soup with 500 naira. Read what he shared below. By now, I guess you all know I am #voltron. I love to stand up in defense of people especially when I don't understand the reason they are being vilified and or bullied. A young lady, thinking she was being helpful, posted how she used 500 naira to cook okro soup. All hell broke loose and people made fun of her calling her unreasonable and unrealistic and a liar. It didn't help that another lady posted that she had tried it and it was possible. That one too received her own fair share of ridicule....surprisingly, more from women. But because I remember how, thirty years ago my mother had to re-adjust and cook at a very low budget after my father's thriving businesses were closed down by a certain man who is now una Oga at the top, I believed the women. So, I bought the following ingredients as given by one of the ladies. Mind you, I did not use anything already in the house... Not even salt... I bought everything. Believe me people, it is delicious and here it is. I cooked it my self...and yes I am a very good cook?. 1. Before you conclude that something is impossible, try it. 2. It is essential to learn to be creative in survival skills peradventure you experience a season of lack and you cannot buy your ingredients in Spar. 3. Those that cannot go to a restaurant to pay 3000 naira for a plate of food for breakfast, lunch and dinner, still have access to nutritional food... Don't rubbish them. 4. Many of us need to come out from the castles we have put ourselves in and go into the real world to appreciate that life goes on even without opulence. 5. Whatever your budget, food can be on the table. A lady was surprised to see Apostle Jay, that she sees only on television, in the market. When I explained my mission, she shocked me by saying that with as little as 400 naira she makes Isam(periwinkle) soup for her family. My life's creed? : Until I have disproved a thing, scripture says to walk in love because love according to 1Cor.13:7 Beareth all things,believeth all things, hopeth all things, endureth all things. NB: Please don't comment about gas or anything like that. The ladies never added fuel to the 500 naira budget.... And by the way, who does that? ?